&###x200B;&###x200B;&###x200B;&###x200B;&###x200B;&###x200B;&##x200B. &###x200B;&###x200B;&###x200B;&###x200B;&###x200B;&###x200B;&###x200B;&##xA0. 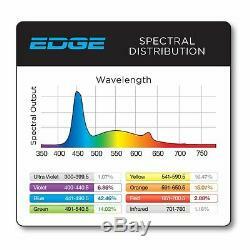 AquaticLife 24" - 48" Edge Full Spectrum LED Aquarium Light, 3 Models. AquaticLife 24" - 48" Edge LED Aquarium Light, 3 Models. In my opinion: This is great LED fixture for freshwater Planted Aquarium. 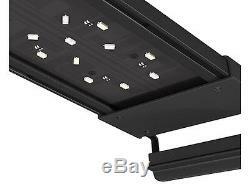 AquaticLife 24 Edge LED Aquarium Light (AquaticLife Item # 420284). The AquaticLife 24 Edge LED Aquarium Light sunrise and sunset functions enable the LEDs to be easily programmed to slowly turn on or off in 10 minute increments over a two-hour period of time, thereby creating a variety of different sunrise and sunset effects. The Aquatic Life Edge LED Lights feature a new, simple-to-use 3-channel timer that allows completely independent control of the bright white, mixed color and moonlight LEDs, creating lighting that replicates underwater daytime sunlight, and sunrise/sunset effects, and the shimmering blue glow of Moonlight. This light for those wanting a high-end, high-wattage LED light with a built in, 3-channel timer that ramps up and ramps down. 23.125" long X 4.0" wide X 2.5 tall. Adjustable width frame mounts support the light fixture above the aquarium. Fits aquariums 23.5" to 26.25". Total wattage consumed: 30 watts. The Edge LED fixtures incorporate five colors of LEDs to ensure a full spectrum of light for most aquariums. 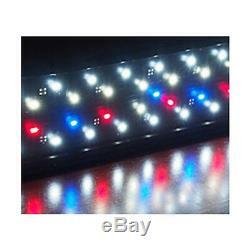 (13) 6K white, (14) 9K white, (17) 10K white, (3) blue, (7) red, (3) blue lunar LEDs. 3-channel timer controls the bright white LEDs, mixed color LEDs and blue moonlight LEDs independently. LED&###x2019;s can be programmed to slowly turn on or off over a period of time to create a sunrise and sunset effect. CUL approved low-voltage power adapter provides metered electric to ensure long life of LEDs. 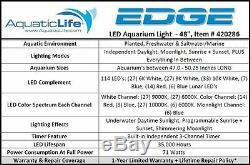 AquaticLife 36 Edge LED Aquarium Light (AquaticLife Item # 420285). The AquaticLife 36 Edge LED Aquarium Light sunrise and sunset functions enable the LEDs to be easily programmed to slowly turn on or off in 10 minute increments over a two-hour period of time, thereby creating a variety of different sunrise and sunset effects. 35.125" long X 4.0" wide X 2.5 tall. Fits aquariums 35.00" to 38.25". Total wattage consumed: 48 watts. (21) 6K white, (21) 9K white, (24) 10K white, (7) blue, (11) red, (3) blue lunar LEDs. 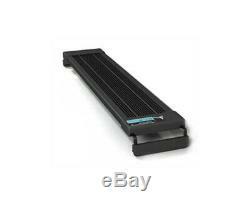 AquaticLife 48 Edge LED Aquarium Light (AquaticLife Item # 420286). The AquaticLife 48 Edge LED Aquarium Light sunrise and sunset functions enable the LEDs to be easily programmed to slowly turn on or off in 10 minute increments over a two-hour period of time, thereby creating a variety of different sunrise and sunset effects. 47.0" long X 4.0" wide X 2.5 tall. 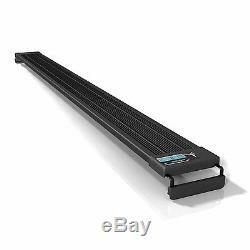 Fits aquariums 47.00" to 50.25". Total wattage consumed: 71 watts. (27) 6K white, (27) 9K white, (33) 10K white, (7) blue, (14) red, (6) blue lunar LEDs. The revolutionary, feature-rich EDGE LED Fixtures from Aquatic Life are a game changer in the realm of outdated, overcomplicated LED lighting systems presently available. These sleek, low-profile fixtures measure only 0.5 inches high and 4 inches wide, and were designed to enhance life inside the aquatic environment, while being almost invisible over your tank. The ultra-slim design coupled with state of the art LED technology ensures maximum light output is focused inside the aquarium, while five colors of 120-degree dispersion, 0.5W Watt LED&###x2019;s ensure a full-spectrum of light needed by all the tank&###x2019;s inhabitants. 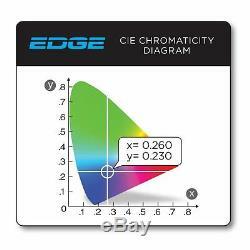 The Aquatic Life EDGE LED Fixtures also introduce advanced features to both the novice and expert aquarist. The new Sunrise + Sunset Functions enable the LED&###x2019;s to be easily programmed to slowly turn on or off in 10 minute increments over a two-hour period of time, thereby creating a variety of different Sunrise and Sunset effects. The Aquatic Life EDGE LED Fixtures feature a new, simple-to-use 3-Channel Timer that allows completely independent control of the Bright White, Mixed Color and Moonlight LED&###x2019;s, creating lighting that replicates underwater daytime sunlight, and sunrise/sunset effects, and the shimmering blue glow of Moonlight. All three sizes were designed to provide the absolute maximum light output possible, while avoiding any heating of the aquatic environment. The adjustable width aquarium frame mounts with extendable arms safely support and position the fixture above any tank size. The EDGE LED Fixtures incorporate five colors of LED&###x2019;s to ensure a full spectrum of light for most aquariums&##xA0. Three Channel Timer controls the bright white LEDs, mixed color LED&###x2019;s and blue moonlight LED&###x2019;s independently&##xA0. LED&###x2019;s can be programmed to slowly turn on or off over a period of time to create a Sunrise and Sunset effect&##xA0. Built-in Moonlights add shimmering effect throughout the aquarium&##xA0. These slim fixtures measure 0.5 Inches high and 4 Inches wide to ensure the focus is on the aquarium. 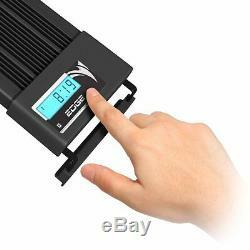 CUL approved low-voltage power adapter provides metered electric to ensure long life of LED&###x2019;s. Adjustable width Aquarium Frame Mounts support the light fixture above the aquarium. Available in three sizes to fit most aquariums. 24 Inch model fits Aquarium Frames between 23.5 Inches and 26.25 Inches. 36 Inch model fits Aquarium Frames between 35.0 Inches and 38.25 Inches. 48 Inch model fits Aquarium Frames between 47.0 Inches and 50.25 Inches. Low Voltage Power Supply Qty. Communication is an important part in &###xA0;giving you an enjoyable encounter, and in making sure that all of your needs are taken care of. We understand that it is important for our customers to get what they ordered as fast and as hassle free as possible. We work with suppliers with high quality products to give you the best goods possible. It is important for us to give our customers an enjoyable experience, as we put our customers first. In the uncommon occurrence when a customers is not contented with the product they receive, we will do all that we can to fix the issue. If you have any inquiries, please let us know and we will fix it! We promise the best when shopping with us. &###x200B;&###x200B;&###x200B;&###x200B;&###x200B;&###x200B;&###x200B; Welcome to Ecoquatic. 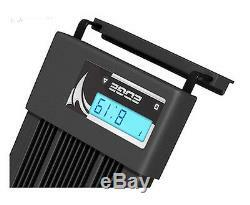 The item "AquaticLife 24 48 Edge Full Spectrum LED Aquarium Light, 3 Models" is in sale since Monday, February 17, 2014. This item is in the category "Pet Supplies\Fish & Aquariums\Lighting & Bulbs". The seller is "reefguy007" and is located in Tempe, Arizona. This item can be shipped to United States, Canada, United Kingdom, Denmark, Romania, Slovakia, Bulgaria, Czech republic, Finland, Hungary, Latvia, Lithuania, Malta, Estonia, Australia, Greece, Portugal, Cyprus, Slovenia, Japan, China, Sweden, South Korea, Indonesia, Taiwan, South africa, Thailand, Belgium, France, Hong Kong, Ireland, Netherlands, Poland, Spain, Italy, Germany, Austria, Bahamas, Israel, Mexico, New Zealand, Philippines, Singapore, Switzerland, Norway, Saudi arabia, Ukraine, United arab emirates, Qatar, Kuwait, Bahrain, Croatia, Malaysia, Brazil, Chile, Colombia, Costa rica, Dominican republic, Panama, Trinidad and tobago, Guatemala, Honduras, Jamaica, Viet nam, Uruguay.